Week 2 – How a stranger made a difference in my life. Now that the New Year is upon us, it’s time to register for the “Self Care for the Creative Soul” retreat at Miraval if you plan to join us so you’re sure to get a room. You can read all about the retreat here. I’m live on the radio on Monday (1/6) at 5pm ET/2pm PT and you can call for coaching at (866) 254-1579 and listen here. How a stranger made a difference in my life. Today’s blog is a thank you to a stranger in my neighborhood. A woman I’ve never seen before, but who came along at the moment I needed her most. It’s a little bit early for the winter doldrums, but I feel them sneaking in. We’ve had a lot of snow this week, more than eighteen inches, and it’s been freezing cold. This morning I woke up feeling a bit trapped and resigned. How many more months of this? I made a cup of tea and went to have a look at the back yard. 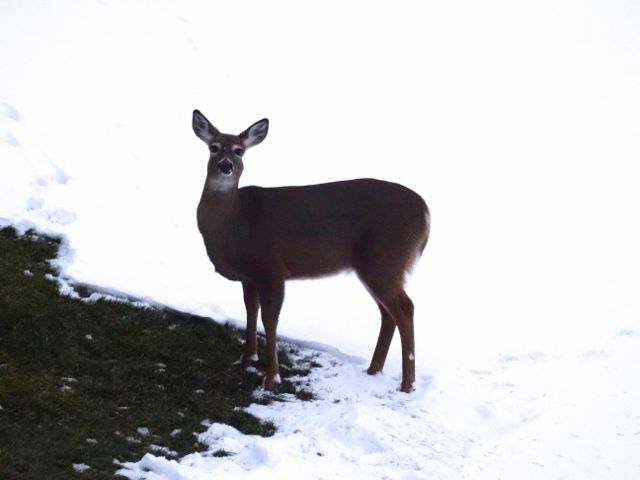 Yesterday there were deer tracks all over the field in and around my plants, so I knew they were looking for food. Because I love them so much, I went out later in the day and shoveled a couple of wide stretches of grass to help them out. I was anxious to see if they’d been back to eat. Unfortunately there were no new tracks. I decided to go out for a long walk to get some sun. For the first three miles or so, I saw deer tracks everywhere and was lucky enough to see a few cardinals and a couple of red squirrels, too. When I circled down around the reservoir where we live, however, I discovered something upsetting. A deer must have wandered out onto the frozen water overnight, somehow couldn’t get back, and ended up becoming food for other animals – possibly coyotes. Now I know that animals need to eat, but it broke my heart to find that dead deer on the ice. I stood there crying as I said a prayer for that precious animal’s soul. I’m just not cut out for this cycle of life thing. I stayed there praying for a little while as a way of honoring its life, and then continued my walk home. Unhelpful thoughts filled my head: You have to face reality Cheryl, death and destruction is a part of life. You have to stop being so concerned about the animals in the neighborhood. You can’t control nature, this is what happens. Other people don’t get this upset. You’re just too sensitive. Several yards ahead, walking towards me, was a woman holding a bag of hot dog buns. I watched as she reached into the bag, carefully crumbled a roll in her hand, and then tossed the food out across the field. She continued to do this until we reached each other and smiled hello. I felt strangely comforted by her. I wasn’t the only one concerned about the needs of the wildlife in our neighborhood. I cleared grass patches, she spread food. The critical voices quieted down and I suddenly didn’t feel so weird or alone. 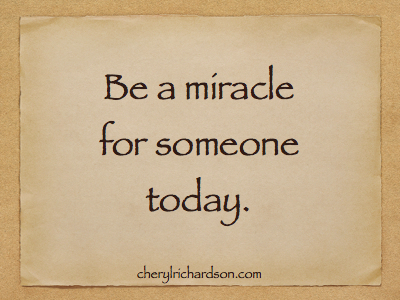 Isn’t it wonderful how we can do that for each other? I’m grateful to the woman in my neighborhood and I send her love and blessings. We’re all connected, humans and nonhumans alike, and the more we care, the more we open ourselves to this beautiful interdependence. As I sit here in my office ready to finish this blog, I look up from my laptop and I can’t believe what I see. I love people who care about strangers. Check out this act of kindness here.